Do you remember much about the end of the Cold War? The significance of November 9, 1989? 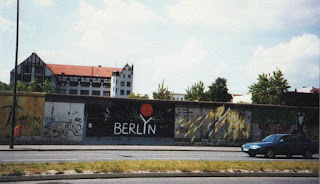 Such a momentous event as the crumbling of the Berlin Wall came about by accident. I’ve been reading When the World Seemed New; George H. W. Bush and the End of the Cold War, by Jeffrey A. Engel, which details this critical period of recent history. Eastern Europeans were demonstrating for more freedom. The Soviet Union wasn’t stopping them. The satellite countries’ leaders were in a quandary. With no help from the Soviets, what should they do? All Gorbachev did was advise maintaining East Germany’s integrity, even if it meant loosening the borders. Hoping new travel regulations would pacify the thousands of protesters, on November 9th, Krenz gave his spokesman, Günter Schabowski a paper describing the new reforms. They would be released on the weekend. Schabowski’s news conferences were boring affairs as he plodded through reading pronouncements, capable of putting newsmen to sleep. He stuffed the paper into his briefcase without looking at it and headed to the news room. Asked about the government’s long-promised travel reforms, Schabowski dug out the paper and stumbled through it, forgetting it wasn’t to be made public just yet. The newsmen perked up. Here was something significant. When would the new regulations go into effect? The news sped around the world. Crowds gathered at Berlin’s crossing points, demanding to cross. The border guards had heard nothing of a new travel policy. Not wanting bloodshed, he ordered the gate opened. Hundreds of people streamed through. They danced on the wall. Freedom came to East Germany, all because a spokesman misspoke. A preserved section of the Berlin Wall is now an art gallery. An artist friend illustrated a scene he had in mind, a family celebrating the holiday at the table, bordered by images of people helping the poor. Cole had a thousand copies made by a London printer on stiff cardboard. At the top was the salutation, “To: _____” along with “A Merry Christmas and A Happy New Year to You.” Cole added his friends’ names and sent out the first Christmas cards. An 1877 card doesn't look Christmassy. A German immigrant created the first Christmas card in the United States in 1875. 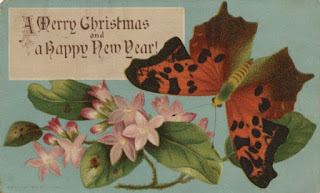 Louis Prang’s card featured a painting of a flower and read “Merry Christmas.” Early American Christmas cards were beautiful, but didn’t contain a Christmas or holiday image. Modern Christmas cards began in 1915, when a postcard printing company started by Joyce Hall in Kansas City, published its first Christmas card. He was joined by his brothers, Rollie and William, and the Hall Brothers Company adapted a four-inch-wide by six-inch-high format, folded once, and inserted into an envelope. Postcards didn't have enough room for folks who wanted to write a short message, but not a whole letter. A decade later, the company changed its name to Hallmark. 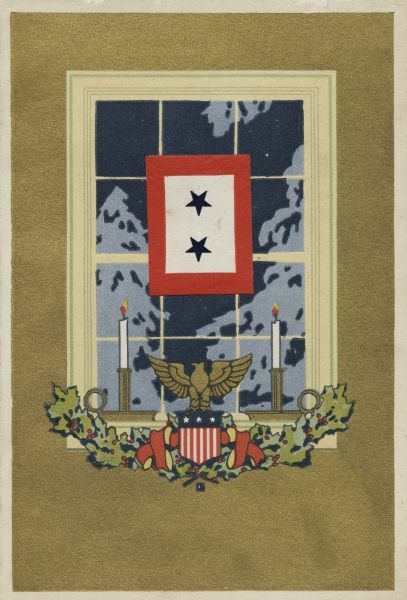 The service star was a frequent theme in many WWI cards. During World War I, sending cards to soldiers was considered a good way to boost morale. Many combined patriotic and religious symbols, while others sought funds to support war orphans or refugees. Cards sent during World War II differed in spirit and appearance. Many WWII cards made no reference to the war, but conveyed a longing for peace with an underlying optimism. Danz School had four kindergarten classes, two in the morning and two in the afternoon. I attended a morning class. A school bus brought everyone in K through 6 to school, and at noon, a bus took the kindergarteners home. That was fine, until one December morning, a blizzard blew in. Schools closed, and the buses came to take everyone home. That was not exactly fine. Used to a single bus, I didn’t know which bus to board. I got on one with my friend, Heidi. That was the correct bus for Heidi, but not for me. 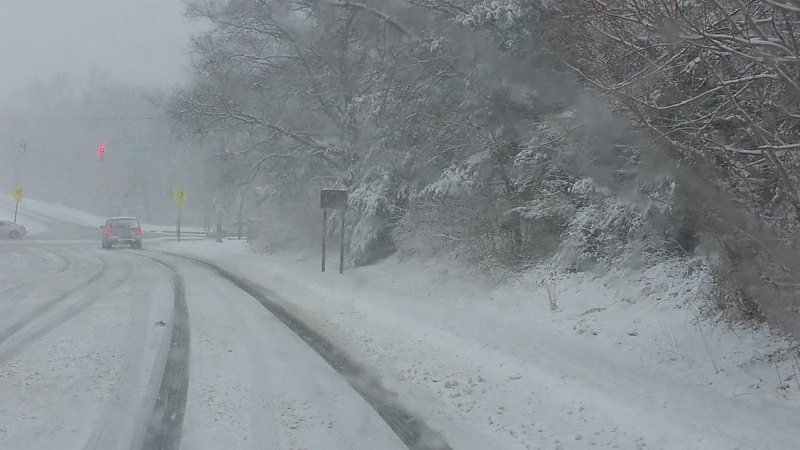 Fortuitously, we were seated on the front seat. The bus driver quickly realized she had a misplaced 5-year-old. Ignoring the worsening weather and her busload of normal kids, she headed for my home. I don’t remember if I was able to give directions. My sister may have had friends on that bus, but would a second-grader be able to direct the driver to an unfamiliar home? That remains a mystery. This was years before cell phones, and I don’t recall if the driver was able to radio to the bus hub. 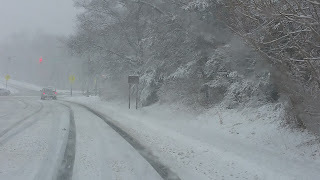 My sister, of course, boarded the right bus, and had gotten off at our usual stop, a block up the hill from our home at the dead end. She rushed down the street, anxious to tell our parents that I hadn’t been on the bus. Suddenly, another bus rumbled down the street. My dad had been in the garage, and heard a commotion outside. Looking out, he found a school bus in our driveway, and I hopped off. God bless the driver who went the extra mile (actually, probably more like ten miles) to deliver a lost child to her front door. I chose the B-17 for my Promise For Tomorrow series because I was most familiar with big bomber. I’d read Robert Vaughan’s Touch the Face of God and loved it. The B-17’s crew of nine or ten men offered a supporting cast of characters for my hero to interact with. And it looks good. 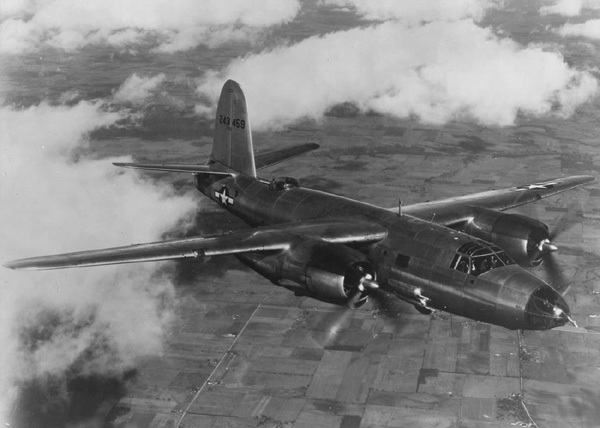 The other big American bomber, the B-24, was nicknamed the pregnant cow. Does that sound like an appealing star vehicle? Although I didn’t know it when I wrote Friends & Enemies, other authors also featured the B-17. If I were to start over, I might use the B-26 Marauder, a medium bomber. The B-25 Mitchell is famous for Doolittle’s raid on Japan in April, 1942, but who’s familiar with the B-26? Congress considered cancelling B-26 production , but General Doolittle proved it was a formidable weapon and needed only upgraded training and slight airframe correction. A demonstration of a B-26 maneuvering on one engine showed it could be handled safely. The plane was removed from the congressional hit list, and modifications were complete by February, 1943. Pilots received better training in knowledge of aircraft handling and engine performance anomalies. Aerodynamic modifications increased the wingspan along with larger fins and rudders. With its improved take-off, landing, and handling, the Marauder gained a reputation for reliability and performance. The operational loss rate of the B-26 throughout the war was .422%, best of any WWII bomber. Many of the planes flew over one hundred missions. Few exist today. Only one, at Fantasy of Flight in Polk City, Florida, is flyable. I like to highlight lesser known aspects of World War II. I missed my chance with the Marauder.